Feta cheese - just thinking about it can make one's mouth water, with its tiny little tangy, salty bites of goodness! Feta is considered to be a hard cheese, but it is definitely easy to break apart with the fingers or a fork. Feta originates from Greece, and is traditionally made from either goat's or sheep's milk. Experts will tell you that a "true" feta must have a 70% minimum of sheep's milk used in the recipe, but you do have some choice here! Goat's milk will add a bit more "tang" to the flavour, but cow's milk can be used as well. Feta is ripened in a brine, and will develop a stronger flavour as time passes. So a little can go a long way in salads, with fruit, or in pizzas, spanakopita, soups, or even omelets. When making feta cheese at home, you will need to purchase lipase powder, mesophilic culture, liquid rennet, and of course, a non-iodized salt, such as sea salt or Kosher salt. 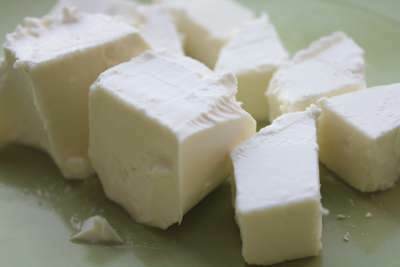 Some feta recipes will require raw milk; pasteurized milk is fine to use, but do not use ultra-pasteurized milk. Also, if you can find it, purchase some butter muslin for when your cheese is draining. Butter muslin is a very, very fine cheesecloth, and it works well for feta production. Assemble all equipment, and sterilize it. Using a double-boiler pot setup, warm milk, gently, to 88o F. Avoid scorching the pot. Add mesophilic culture and lipase once milk has reached proper temperature. Stir thoroughly; cover and let mixture sit for 1 hour. Ensuring that milk remains at 88o F, add rennet (dissolved in water), and briskly stir for approximately 15 seconds. Cover again, and let sit for approximately 40 minutes. After this time, you should see what is known as a clean break. This means that when you stick a knife into the mixture, the curd will break around it (the whey should run into the crack or space around the knife. Then cut your curd, using your knife (or spatula) into one-half inch pieces. To do this, insert the knife vertically into the mixture and cut into slices. Then turn the pot 90o, and repeat the process. DO NOT STIR curds! Allow the curds to rest for about 10 minutes. Then gently stir curd. Keep temperature at 88o F for another 45 minutes. Gently stir curd every 10 minutes to prevent it from sticking back together. Once the 45 minutes have passed and more whey has left the curd, place the colander into the sink. Line colander with dampened butter muslin. Carefully pour the curds and whey into the colander. Once the curds and whey have drained, life up and tie the corners of the muslin together; hang the bag to drain more. After about 4 hours, take the cheese down, turn over the cheese (so that it is upside-down). Seal up the cloth again with the cheese inside. After the cheese has hung again, remove it from the muslin cloth; discard cloth. Cut cheese into 3-inch blocks. Sprinkle cheese blocks with Kosher salt and place in a large storage container. Allow cheese to sit in the container (covered) for 2 to 3 days, in order for the cheese to harden. NOTE: more whey will come out of the blocks during this time. Transfer cheese into a large jar, and add brine. Allow to age or ripen for about 2 to 4 weeks: this will help to develop the Feta flavour. Refrigerate.